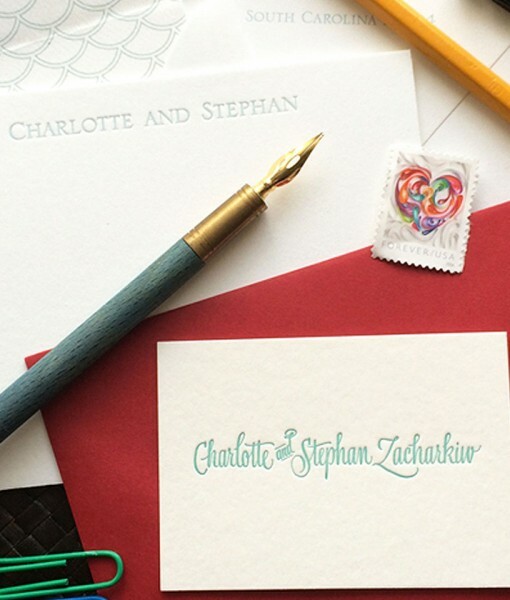 Your spouse and you (or your favorite couple) deserve the best stationery. The “Dulles Couple’s Suite” bespoke projects are the ultimate way for astute couples to celebrate and communicate in style with custom designs, distinctive hand-lettering or curated fonts, and beautiful finishing touches such as hand-painted beveled edges and custom patterned envelope linings. Essential for your spouse and you or wonderful as gift for your favorite couple. To begin a printing project or request a quote from anywhere, simply subscribe here. As a Dulles Designs Subscriber, you are directly connected to Emilie Dulles via email, text, and phone –– and able to schedule first-priority conversations. Subscribers can speak with Emilie, and be invited to meet Emilie in the Washington DC, New York, Palm Beach, and Charleston areas by private appointment or trunk show.